First thing's first: THERE IS NO LOVE TRIANGLE IN THIS BOOK. I promise you all. Someone on Twitter skimmed through the book and saw a particular scene and was immediately convinced that there was a love triangle in the book - which promptly irritated many people, including me. Of course, I was still going to read the book, but many people decided not to, after seeing the tweet. THERE IS NO LOVE TRIANGLE. There is a plot device happening that might *seem* like a love triangle, but it's not the case. I think the author probably knows (just like we do) how ridiculous it would be to invent a love triangle in book two of a DUOLOGY. But anyway. More on that later. In this sequel novel to All That Glows, we follow Emrys and her journey as a once-fae mortal. She will marry Richard soon, the love of her life and King. Despite some of the court and media's dislike of her, things seem right. Except that something is wrong. An ancient evil is released from the secret fae labyrinth prison, and Titania does not want Emrys involved. But then Richard is captured right in front of Emrys, and all of London is up in arms. Emrys is now a fugitive, with Princess Annabelle, and an Ad-hen (immortal prison guard of the secret labyrinth prison). But Emrys will do anything to get Richard, even in everyone believes that she is the one who did him away. Right from the beginning, we can see several conflicts. Emrys's internal conflict is a large part of this book. She is mortal now, but she *could* get her powers back from Herne (the Huntsman), if she turned her back on the human world - on Richard. But she loves Richard. Except - it seems that Richard has been too busy for her, and it's especially bad that the court and media and people of London don't like that a Fae is set to be Queen. Only Annabelle really seems accepting. Personally, I think the fact that this internal struggle was so strong and encompassing was a really well-done and necessary part of this book. Some might have found it a bit much, but I loved how Graudin made this a primary issue. Emrys couldn't have just gone from fae to mortal and have made the transition well and easy and everyone accepted her and they rode off into the sunset and lived happily ever after - no, not realistic at all. It also shows Emrys's character development, which I thought was written well. Something that authors like to do in sequels is shake up the relationship between the male and female protagonists - the couple. Most of the time, this is done via love triangle. I like that the author did this via REAL reasons - well, reasons that I think are "real" and valid. Richard is a king, and has to be in Parliament for most hours of the day. Valid. This makes sense to me. There are other things, and sometimes I thought that Emrys was a little *too* insecure, but I liked the authenticity of the obstacles in Emrys and Richard's relationship. I also liked how they (for the most part) talked about things, eventually. Some things weren't discussed between them until the climax of the book, but for the most part, Emrys and Richard communicate relatively well. In terms of the romance... okay, look. It might SEEM like there is a love triangle in this book. Trust me, you'll got through about 40% of the book and not care. But then a certain male is introduced, and it's going to seem like Emrys develops feelings for him. REAL QUICK. Guys, that should be a tip-off, right there. It is VERY FAST. So... YES, it does seem like a love triangle in this book. But it lasts about 35% of the book (from 40% in to about 75% in), and it's really not a love triangle. I'm only mentioning this because someone on Twitter skimmed the book (didn't actually READ the book) and misled a lot of people. THERE IS NO LOVE TRIANGLE. Promise. I hate love triangles. I would never lead you astray! In terms of the story, I was pretty engrossed, which is a good sign. I was curious as to who the prisoner was that escape, what that had to do with Richard's capture, how Emrys would be able to help anything (being basically powerless). Graudin definitely took what seemed like a forced plot idea and made it into a great story for the sequel. I thought the whole all-of-a-sudden-a-prisoner-has-escaped was so coincidental and a way to force a plot, but Graudin tied everything together and made sure that things made sense. There is a historical part to this book that the author uses a lot, and I liked this. It helped make sense of what Emrys's role in everything was (super vague, I know). Overall, I'm quite pleased with this sequel/conclusion novel. The ending isn't too sad, for a conclusion novel, but it isn't overly sunshiny and wonderful. I like the ending a lot! One thing that bothered me was the beginning - it was a bit slow, and it was riddled with Emrys's insecurities over Richard. She's convinced herself that he doesn't love her (because he's always at Parliament, being a king...). She gets silly ideas into her head and they bother her and honestly, I understand, but some things are silly. Like getting upset because she gave up so much to be with him and feeling like he's not giving up much to be with her. That's not fair. Also, I thought this was a historical fantasy novel - emphasis on historical? The media is a HUGE part of this book - I mean like, paparazzi and lights camera action kind of thing. Meanwhile, you have kings and queens and carriages and swords. Confusing. I mean, if that's the type of world you're going for, then it's not anachronistic, but I didn't think it was that way in All That Glows. If you read All That Glows, I definitely think you should read this novel! It's an excellent addition to the series. I feel like it's not entirely necessary to read this one, if you read the first book (because the first ends nicely), but this one solidifies the story. And if you haven't read All That Glows, then, two words: historical fantasy! 4 stars. I liked this book! I'm definitely a fan of this author's work (I've enjoyed this book, All That Glows, and The Walled City), and I'll be reading her books in the future. I haven't read the first one yet, but its on the list. I guess the insecurity had to be there though its irritating. I'm one for real barriers and not just trumped up ones to fill some space in a story so I'm glad the love triangle was a misfire. I look forward to seeing how she copes with the disappearance and troubles as a human against fae magic. I know what you mean! And I liked the internal struggle Emrys dealt with in this book - it definitely kept things authentic! It's an awesome series! And only two books, so no waiting for a third one :D I hope you enjoy this series, if you happen to read the books! DM'd you on Twitter! Fear not! I'm not sure I'll be reading this duology but I'm glad that you enjoyed both books and that despite the suspicions, there's no real love triangle in this one! I'm so not a fan of adding a love triangle in book 2 to shake things up, all it manages to do is annoy me and make me want to stop reading!! Tweeted at you! There is no love triangle at all - as I stated (in all caps) several times in this review. I'm not usually a fan of historical fiction, but historical fantasy sounds intriguing :-) I think I'll check this one out!! I LOVE HISTORICAL FANTASY! Personally, the mix of the two genres is always so interesting. Awesome, Jamie! I hope you love the series if/when you read it! It's so funny! 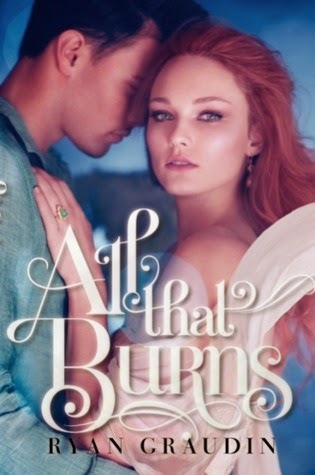 Here I am looking at Goodreads and debating if I should start reading this one :) I gave All that Glows three stars (I think), so it seems that All that Burns is even better. Thanks for the review! LOL! Well that's fate ;D I liked both books a lot and would recommend All That Burns to you! Hopefully you love it ^_^ You're welcome - and thank YOU!